When I first moved into my home in 2008, I had already decided to allocate one of the bedrooms as a dedicated art studio. As I was having carpets fitted throughout the house I spent a while thinking about whether I should carpet the studio or not, or just leave the bare floor boards uncovered. 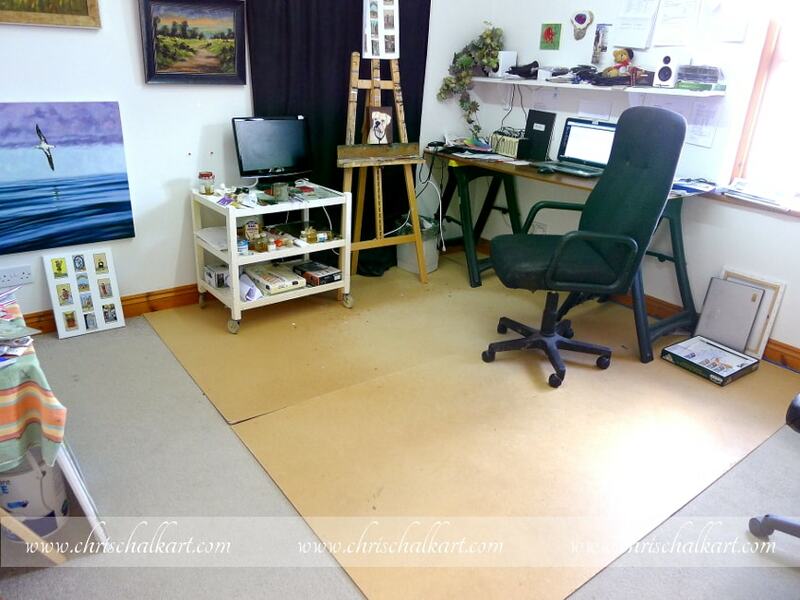 After some thought I opted for a combination of the two, I had my studio carpeted along with the rest of the house but I then went to my local hard-ware store and purchased 2 sheets of 3mm x 1220mm x 2440mm ( 8 foot x 4 foot ) hardboard to lay on the floor over the top of the new carpet, as a sacrificial covering. 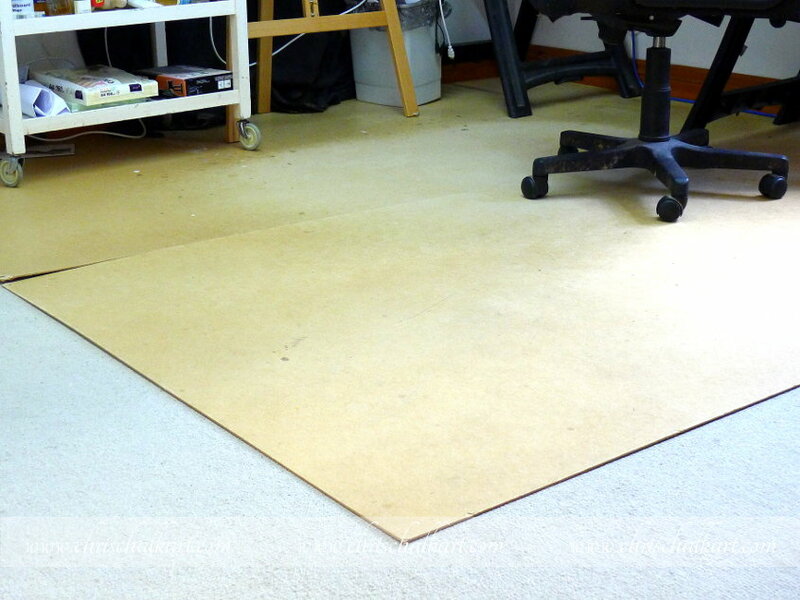 Because my floors underneath the carpeting are wooden, I was able to tack down the hardboard sheeting with carpet-tacks to stop myself, or anyone else, tripping over the corners and edges of this sheeting. Unless the hardboard sheets are tacked down in some way the corners can lift up when weight is applied to the rest of the board, so tacking them down is a must. 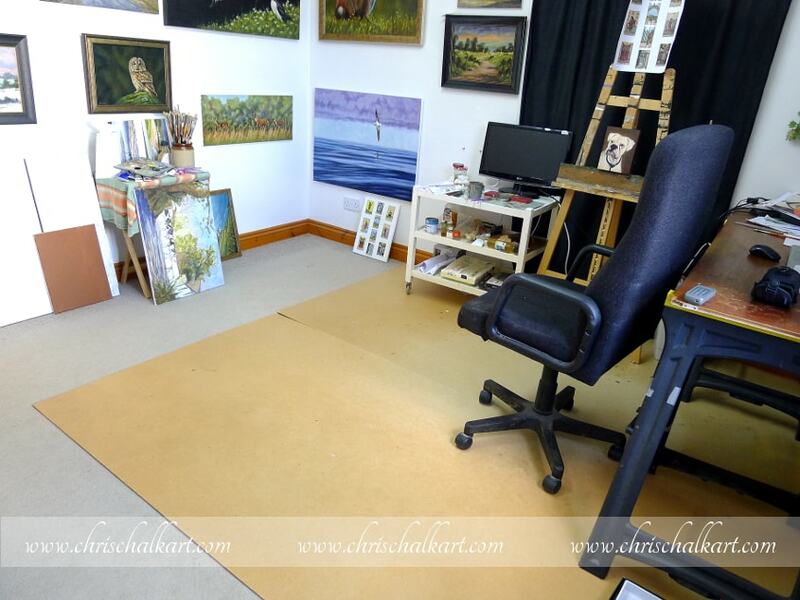 In my own case, there was no need to cover the entire studio floor with these hardboard sheets, I just used 2 sheets where I knew my easel would be and where I knew my chair would wear most. 2 sheets is an area 8 by 8 feet, which is plenty of covering in my own case. I would say that I’m quite a tidy painter, and I tend not to throw too much paint around, but I know that some artists have a much more free style of painting and in this case more boards wold be needed, and perhaps the whole floor covered with hardboard. You can see the wear caused by the wheels on my chair over the years, also a fair bit of paint splatter that was saved from landing on the carpet beneath the boards. I’ve nailed/tacked the hardboard sheets down through the carpet and into the wooden flooring beneath, this keeps the hardboard sheets flush with the floor so they pose no trip hazard. 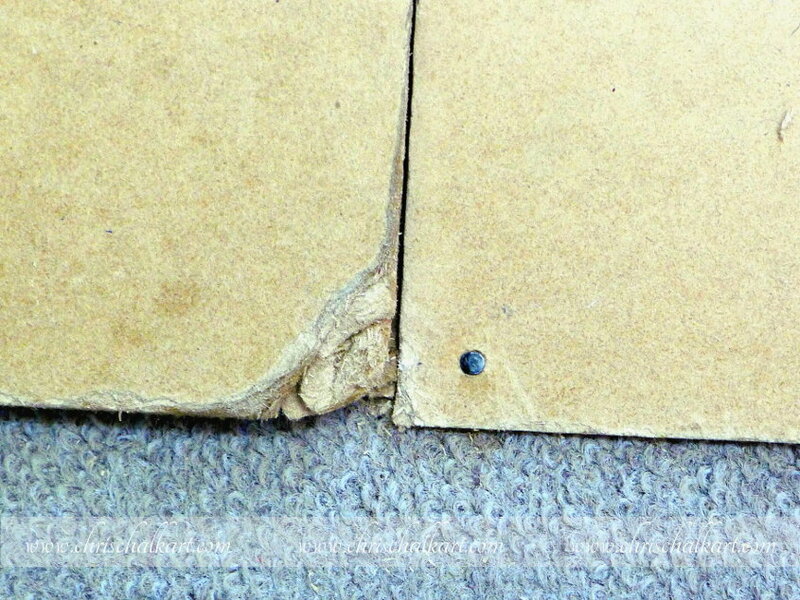 You can see where the carpet tack/nail has come loose in the damaged corner of one sheet here, and already the board has lifted a little, and become a trip hazard. 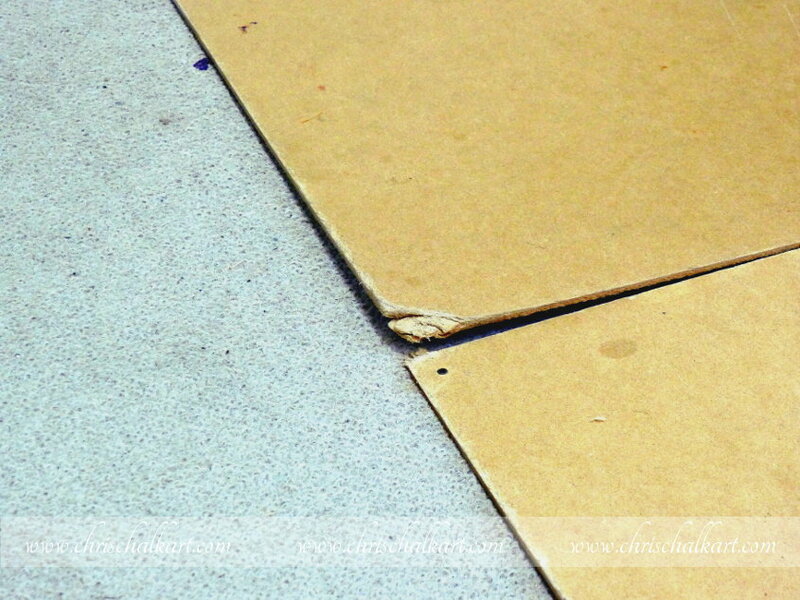 This photograph highlights the lifted hardboard edge, a trip-hazard if ever there was one. 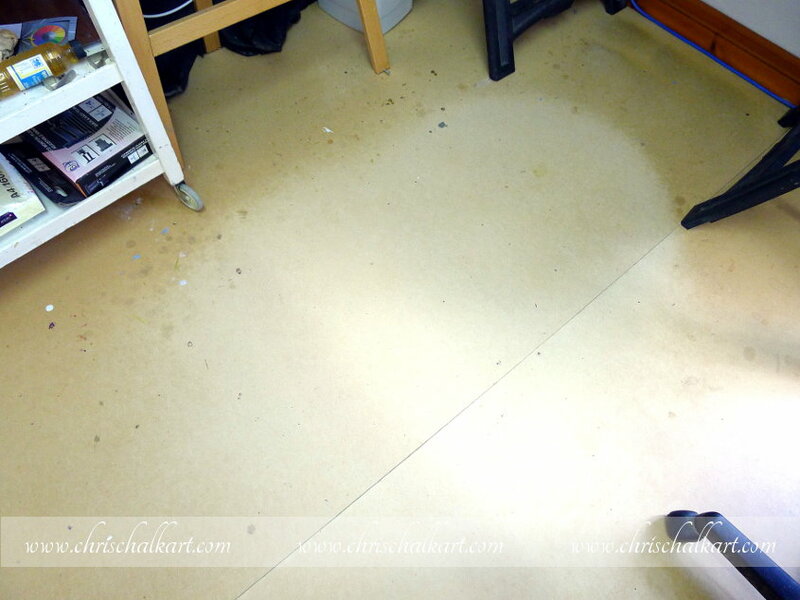 Of course hardboard is not the only material you can use to cover and protect your flooring from paint and damage, I know and artist who uses thick paper, taped down around the edges. Yet another uses thick plastic sheeting taped down and also taped to the walls. You could also use MDF sheeting, which is also cheap and easy to cut. The added advantage of using a robust smooth floor covering such as hardboard of MDF sheeting, is that your chair if it has wheels, rolls beautifully and effortlessly around on it.